Cholee has kept fish for over ten years. She currently has 3 tanks and keeps everything from invertebrates to the black red tail shark. Freshwater aquariums are a great beginner hobby for adults and children alike. Freshwater tanks require less maintenance and cost less to start up than a saltwater tank, or even a simple reptile tank. This article will go into detail about some of the common mistakes beginners make and how to avoid them. I will also lay out how to properly set-up a fish tank and when to add your fish in order to keep your losses to a minimum. Despite common belief a larger tank will actually be easier to care for. Why? It's simple, the larger the aquarium, the better chance the aquarium has to replicate nature. The larger your tank is, the more area and water you have to deal with. Larger tanks are better able to handle slight changes in pH and other chemicals compared to smaller tanks. Where a small 10-gallon tank might re-cycle with a slight bump up or down; the larger 50-gallon tank will have more water to dilute and re-balance out without causing your tank to go through a mini cycle. Rather than starting small and working up to a larger tank, if your pocketbook can afford it, I would start big. Small tanks not only limit what you can keep, but they can be costly and very hard to cycle. Level the stand: It is extremely important to make sure your stand is completely level. The stand you will be placing your aquarium on needs to be flat and level to ensure even weight distribution and to prevent the tank from cracking or warping. Clean out the new aquarium, gravel, and decorations: Always use lukewarm water and a cloth when rinsing out any aquariums. 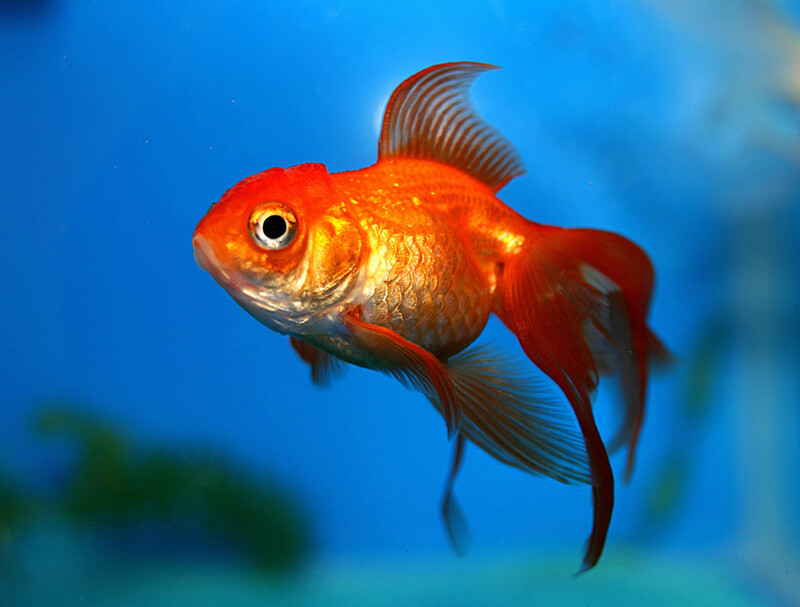 Using soap can seriously harm your fish, as residue can remain in the sealant or on the glass. If you are trying to clean a used tank you can use Rydyt from Python Products if you are looking to use something more than water. White vinegar and hydrogen peroxide are also aquarium safe. Fill the aquarium: You will want to start by only filling the tank 3/4's full with tap water. At this point add your filtration system. Follow the instructions on the filter box to ensure you are installing your particular system correctly. Add the heater: You will also want to add the heater before completely filling the tank, however, don't plug it in just yet. The heater needs to sit for at least half an hour in the water to prevent thermal cracking. You also do not ever want to turn your heater on, unless it is completely submerged in water. Most heaters will have a water line, which means the device can not be used if not submerged to that line. 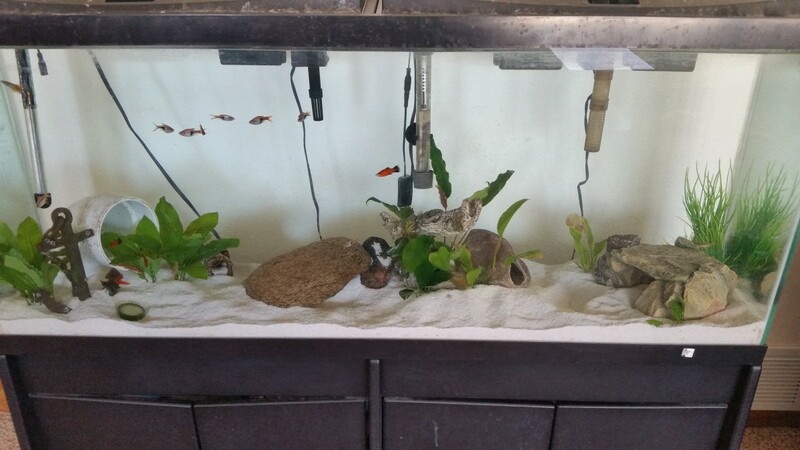 Decorate: Prewash and add all of your decor and plants (live and/or fake) to your aquarium. Finish adding the water: As a general rule, the water level should be an inch from the top of the tank. If keeping snails, especially mystery snails it's best to leave 2-4 inches at the top. This allows for the females to lay their eggs. Add water conditioner: This is also the time to add in any other additives being sure to follow all instructions on each bottle. Prime is my go to water conditioner. Not only will it remove most metals from your tap, but it also helps to keep harmful toxins from killing your fish. Prime will detoxify ammonia and nitrite up to 1ppm. A water conditioner should be used not only at start up, but every time the water is changed. This allows for the chemicals in your tap to be removed. A conditioner like Seachem Prime is necessary for the health of your fish. I have yet to lose a fish since I've started using it. Turn on the filter and heater: Monitor your temperature with a thermometer for the next 24 hours. I always like putting the thermometer in last to ensure the best suction. This way I don't have to go in and adjust or restick the thermometer to the glass. You will need to filter your tank for at least 2 to 6 weeks before adding any fish to your aquarium tank. The water pressure and chemicals in the water need time to equalize and settle before you can add any creatures to your tank. 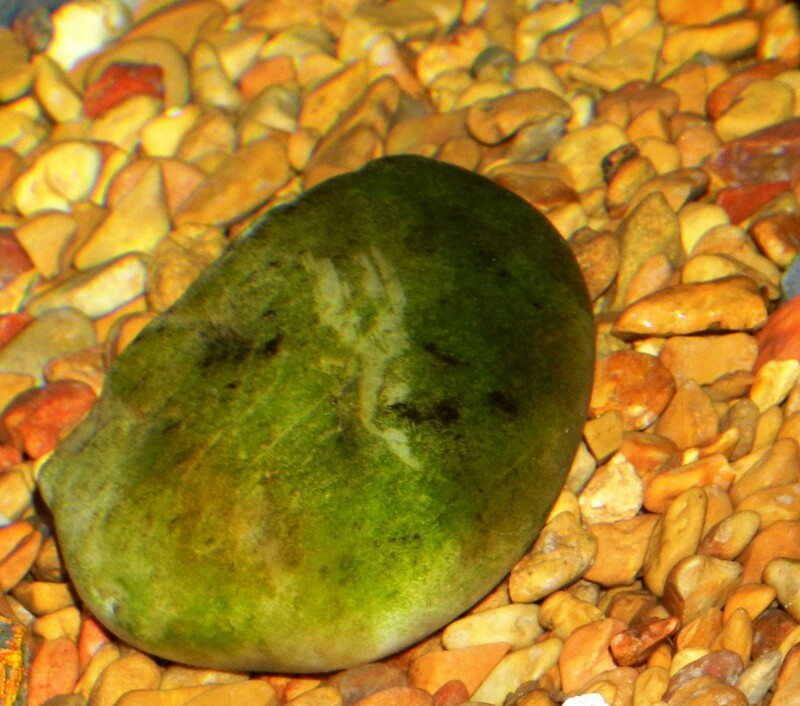 For a freshwater tank, it is not necessary to filter longer if everything in your tank is clean and working properly. However, your tank will still need to cycle through the nitrogen cycle, so you will need to decide if you want a fish in or fishless cycle. 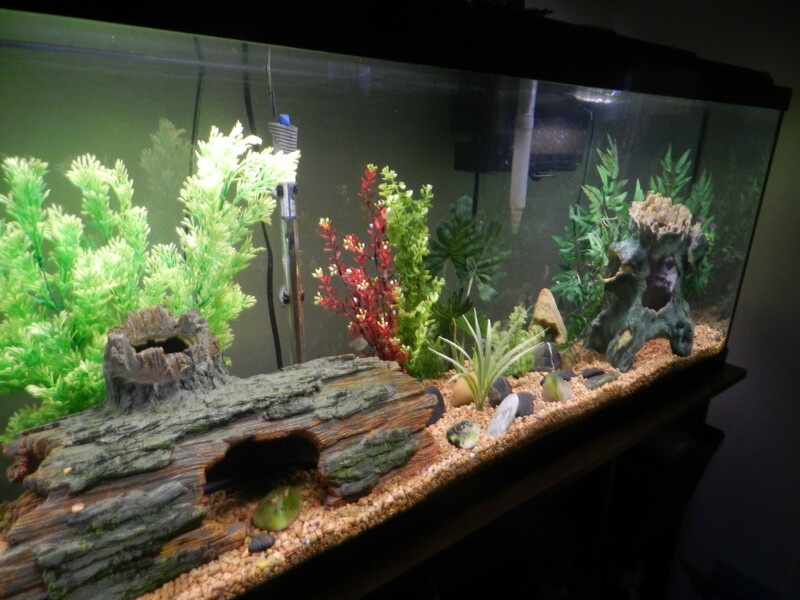 I highly recommended going the fishless cycle as they are easier to maintain and generally make the tank cycle faster. Beginners should always do a fishless cycle, as this helps get one familiar with how an aquarium ecosystem works. Fish in cycles are very hard to cycle and will likely result in the loss of multiple animals. High levels of ammonia and nitrite can also cause serious harm and ultimately kill your pets, so it's best to do a fishless cycle. This process is boring and tedious, however, it is an incredibly important set-up stage. For those that don't completely understand the cycle, a series of mini cycles and fish losses could be in the very near future for your aquarium. There are two ways to start and complete the nitrogen cycle. The first way is to use a couple very hardy fish and wait it out until the fish have completed the cycle. This is not a sure way to cycle any aquarium and could result in a loss of some or all of your fish. You will also need to do multiple water changes and monitor the ammonia and nitrite levels daily. In order to keep the fish healthy ammonia has to be below .25ppm, which makes it very hard to cycle. Prime will keep the ammonia safe for the fish, but in order to cycle, you need ammonia levels to rise above 1ppm. The best way to complete the nitrogen cycle is by first cycling the tank without fish. 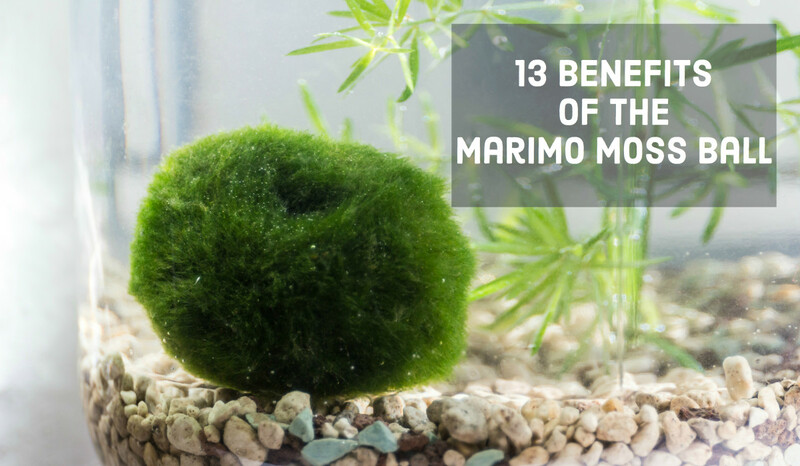 Depending on the size of your tank, type of ammonia used to start the cycle, and how fast the beneficial bacteria multiply, this process can take two weeks to two months, or even longer to complete. 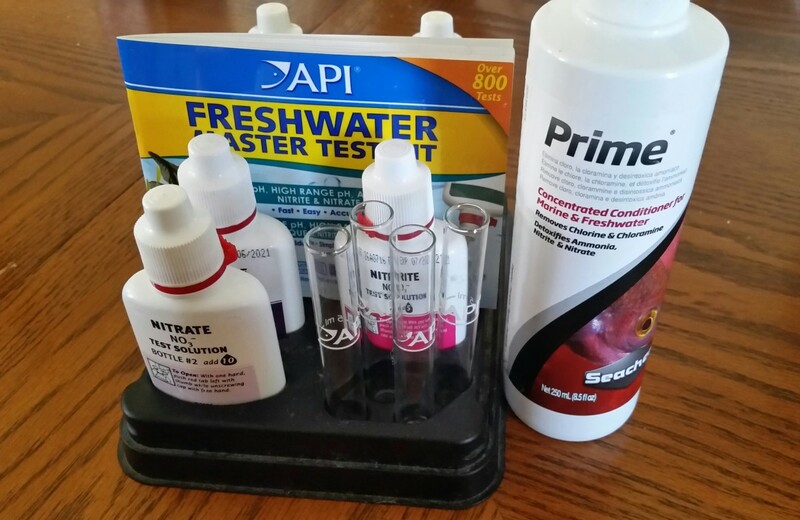 You are going to want to purchase an API Freshwater Master Test Kit to get the most accurate readings of your tank's water. This is a liquid test kit that will last until the expiration date, meaning you will not have to buy another kit for many years. I love this kit because it comes with so many tests, and you have enough tubes to do all the needed tests at once. I have never had any issues reading or otherwise using this kit. Follow the directions exactly and lay the test tube on the white card to ensure accurate readings. My multiple aquariums have never gone through a mini cycle or major fish loss after I started monitoring my water with this test. I've had mine going on three years now and I still have two years left before it expires. Never trust these tests after their expiration dates. Once the tank is cycled, daily and even weekly water tests are not required. This test is one of the most reliable tests I've come across for testing your water. The cheaper water test strips are not a good indicator of water quality and I would not waste money. The API kit lasts longer, produces more accurate results, and will ultimately be cheaper than the strips in the long run. Introduce ammonia into the tank. This can be done in a variety of ways, but I like to use fish food. 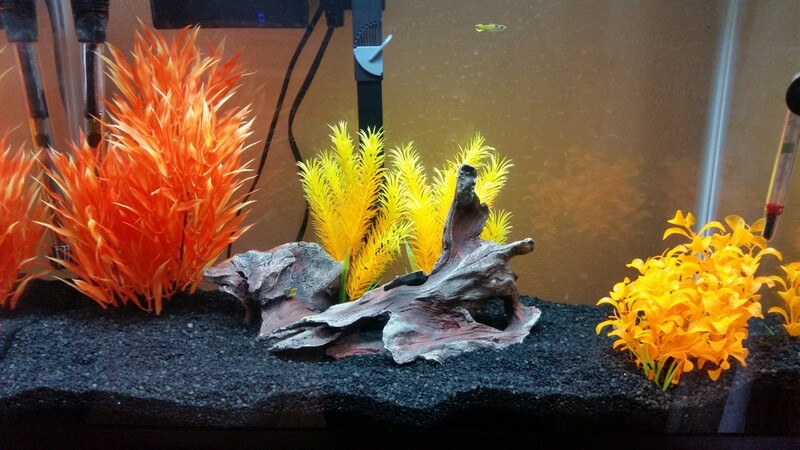 I find that fish food breaks down rather quickly and is easier to work with than using straight ammonia. By testing the water you will be able to see and keep track of the rising ammonia levels. Using straight ammonia is easier to measure ppm, which is important as too much ammonia can cause your cycle to stall. Whichever route you take, always test your ammonia levels daily to ensure that you are getting the proper levels in order to cycle. Ammonia needs to stay right around 1-2ppm in the beginning so it can get converted to nitrite. Too much ammonia and your tank will stall, too little and there will not be enough "food" to feed the beneficial bacteria. Once the beneficial bacteria is created from the ammonia it will start to convert the ammonia into another toxin known as nitrites. Both of these are toxic to freshwater fish and it is important to test the water after about a week to understand how much ammonia and nitrites you have in your water. You will still need to feed your bacteria as without a food source it will die. Ammonia levels should stay around 1ppm while converting to nitrite; anything higher will prevent your nitrite levels from rising. Once the bacteria starts breaking down the ammonia you will start to see the ammonia in your tank fall and the nitrites rising. Once the nitrites get established, another bacteria will begin to form and convert the nitrites to nitrates. Nitrates are only harmful in large quantities, so it is important to start doing water changes once you have an established nitrate number. Again, by testing the water, you will be able to see how quickly the nitrites are being turned into nitrates, by watching the nitrites go down and the nitrates go up. When you have tested the water and your results are 0 ammonia, 0 nitrites, and some amount of nitrates within 24 hours after adding 2ppm ammonia to your tank, you can be sure your tank is fully cycled. Once you have completed the three main steps of the nitrogen cycle, you are ready to add fish. You will want to continue monitoring the tank levels with an API kit or something similar. The bacteria will do the work of converting the ammonia (created by fish waste and leftover food) into nitrites, and the nitrites into nitrates; however, it will be up to you to remove the nitrates. The only way to get rid of nitrates is by dilution. Meaning you need to keep up with water changes. If you have live plants, they will also help keep the nitrate levels under control, but you will still need to do weekly water changes to keep the levels in check. The bio-load, amount of live plants, and the size of your tank will be the indicator of how much water you need to change weekly. I have a 55-gallon tank that is very understocked and partially planted, which allows me to change less of the water while still maintaining my cycle. On the other hand, I have a 20-gallon high tank that needs almost a 50% water change weekly to avoid a mini cycle. The smaller tank is understocked, however, it does not have live plants and due to its size does not allow for an amount of error. Meaning that if levels get even a little bit off, I could very well see a mini cycle and potentially lose some of my pets. Now that we know how to begin our fish tank, let's take a look at some of the common mistakes to avoid when preparing to start a new aquarium. Remember, size does matter when talking about fish tanks, and the bigger the better as it will be easier to manage. The next few points will greatly increase your chances of having a beautiful fish tank with fish that will last for years to come. Adding fish too soon: A mistake that most people make is usually trying to add them the same day they set up their tank. Some people may get lucky and not lose very many fish, however, most will lose at least half if not all of their fish if they put the fish in too early. The only time I see this working out is if the fish is known to be hardy so they can survive through the nitrogen cycle. Many fish and all inverts are too sensitive to survive a start up cycle. And the ones that do, become sick or live a diminished life. Adding too many fish at once: This has the same effect as adding fish too early. Adding too many fish will not allow the bacteria colonies to set properly causing your fish to die off. Adding a few hardy fish to start, is the best way to level bacteria colonies, as well as level off nitrate and ammonia levels if you are choosing to do a fish in cycle. Every couple of weeks you can add fish to build your stock. A couple weeks is enough time to allow the chemicals in the water to settle without having to re-cycle. 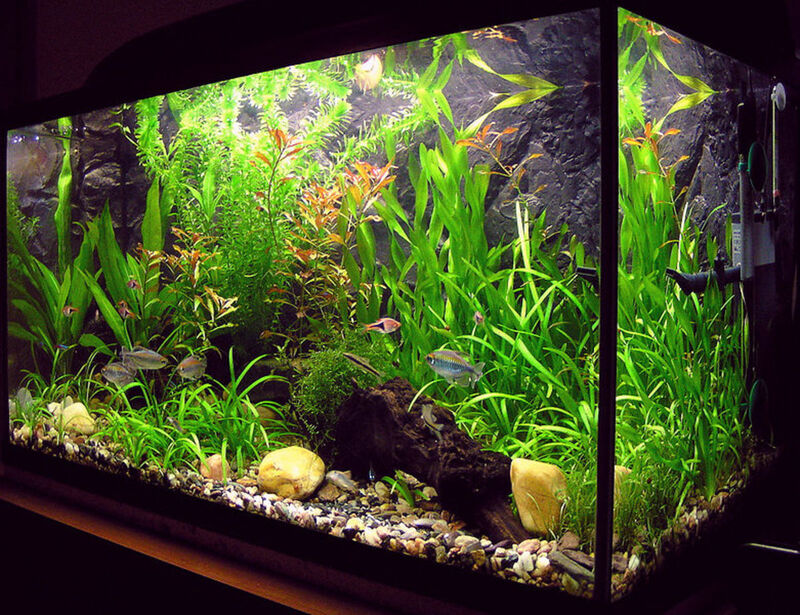 Ideally, it should take several months up to a year to fully stock an aquarium. Overstocking: Is a very common mistake. Most people tend to follow the general rule "an inch of fish should have a gallon of water". This is what you will hear in most pet stores as well, however, this is extremely outdated information. Most people will also use this rule on the size of the fish they are purchasing right now without regards to what the fish's adult size will be. There are so many other factors that need to be considered when stocking; for example what level your fish will swim in (top, bottom, middle, all over), adult size, energy level, bio-load, and how aggressive or peaceful they are. All of these factors come into play when it comes to how many fish you can put in your tank. Keeping incompatible fish: Many new tank owners want to choose fish that look nice together or that appeal to them without properly looking at what those fish need to survive. Putting two incompatible fish in the same tank could result in fights, or one or more fish dying due to wrong water and pH conditions. As well as watching out for compatibility, it is important to know what part of the tank each breed of fish is going to swim in most. 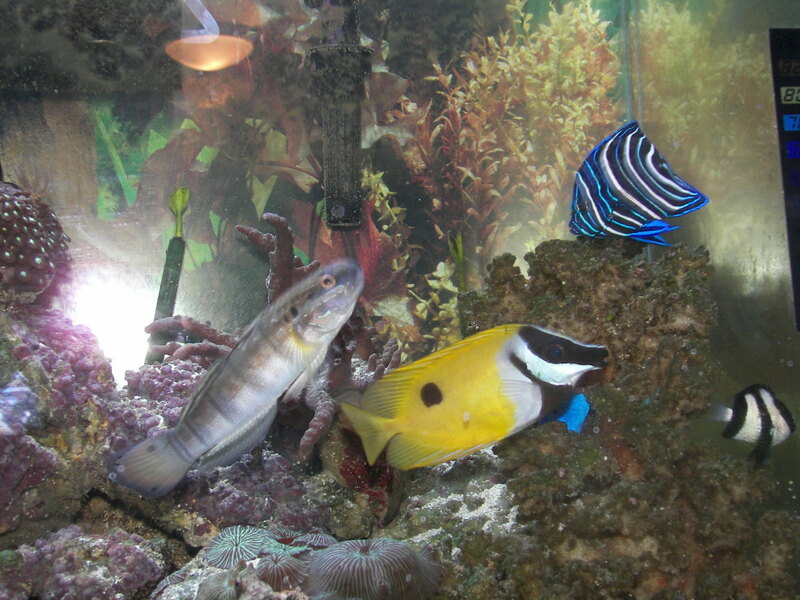 Many fish will swim primarily in the top, middle, or bottom section of the tank. If you purchase all bottom swimmers, not only will your tank look empty, but it can become overcrowded and force you to keep less fish than if you were to purchase fish that swam at each level in the tank. It is also important to note that many species need to be housed in multiple numbers as they are schooling fish. Not all schooling fish will school together, and it's a good idea to do your research on each fish before you make any purchases. Overfeeding: Fish only need to be fed what they can eat in three minutes. The rest of the food will sink to the bottom and create waste. 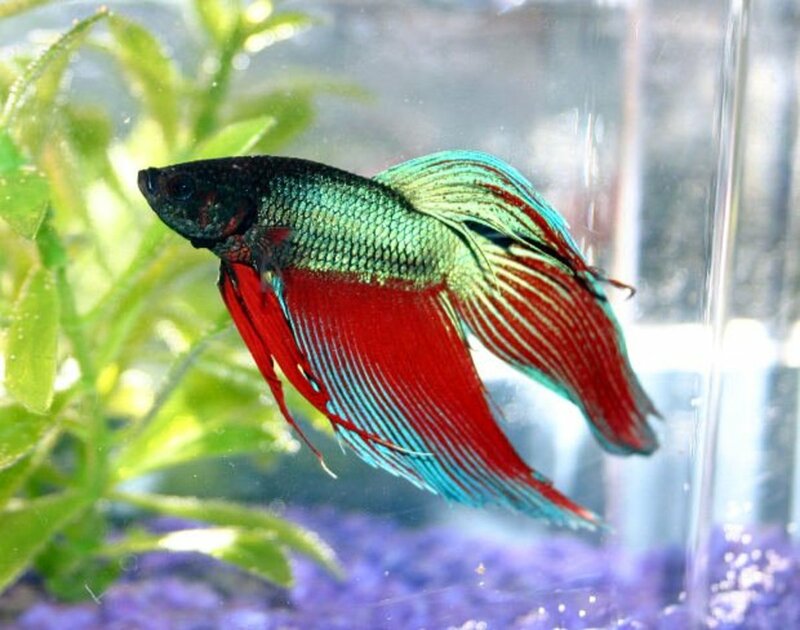 If you are overfeeding and noticing your levels are starting to rise it is okay to stop feeding your fish for a few days, as they will not suffer. I frequently fast my tanks to encourage foraging and reduce the risk of bloat. Wrong filtration: There are several filtration systems that you can choose from. Whether you choose from an air filtration system or a simple hang on the back filter; finding the right filter for your tank is simple. If you're unsure which size to get, opt for the bigger size, always. Over filtration will not harm your tank, however under filtration definitely will harm your fish as it will not be able to keep up with the demands of the bio-loads created. It is also important to remember that you do not want to change your filter media every two weeks. By disposing of your filter media, you are getting rid of all the beneficial bacteria and you will continue to cause mini cycles. Bacteria is stored within the media, and when you throw out the media, almost all of your bacteria is lost. Very little bacteria is actually located on the substrate, plants, and other decor in the tank, and almost none is found within the water column. All that is needed is a good rinse of your filter media during weekly water changes. Use the old tank water to rinse your filter as untreated tap water will kill your BB (beneficial bacteria). It is not necessary to change filter media until it is no longer usable. This means it's falling apart, media that is dark brown/grey is perfectly safe to keep in the filter. Before replacing any media, it is a good idea to let the new filter media run with the old for at least two weeks to establish the bacteria to the new media. This will keep the bacteria in your tank and not cause you to have a mini cycle. 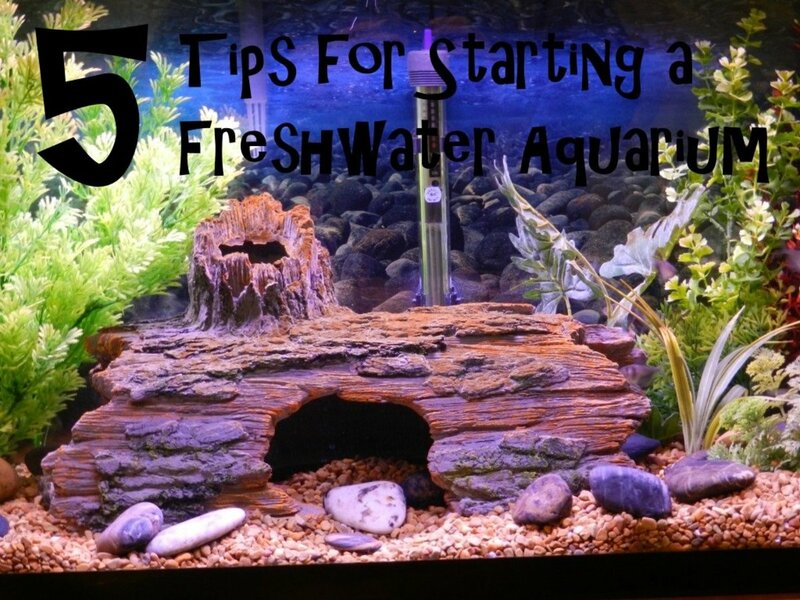 These steps and tips are meant to help any new and beginner fish aquarium hobbyists. Fish tanks are a very relaxing and soothing addition to any room and children will love them! Enjoy your aquarium and experiment within the guidelines of keeping fish to create your dream aquarium. Once established, fish tanks are very easy to maintain and will hold entertainment for years to come. How much food do I need to put in my new 30 gallon tank to start the cycle? Do I feed the tank daily? A few pinches will be plenty of food to start the cycling process. You will want to keep feeding the tank daily until you get to 5 or 6ppm of ammonia. These levels are too high even for the beneficial bacteria. When ammonia gets this high, do a partial water change and back off on the feedings. From here on out you only need to feed the tank what you would feed your fish daily or every 2 to 3 days. Remember to keep monitoring the ammonia levels. After you get a reading of 5 or above (and do a water change), start to monitor for nitrite levels. Once you start seeing nitrite levels then you can test for nitrite as well. Keep feeding the tank as you would feed your fish until you are completely cycled.